Since I began motorcycling about 6 years ago, I've returned to camping. While travelling I like to bring a laptop to stay connected to the internet and download my GPS tracks and camera pictures. As I've gravitated to riding my smaller dual sport bike more, packing room has become a bit tighter and I'm starting to sing the mantra of Sound RIDER 's Tom Mehren "Packing Right, Packing Light." So I began a search of a smaller and lighter laptop. My criteria were that it be under $500, light weight (less than 3 lbs), small, no hard disk drive, and have on-board wireless and wired communications. 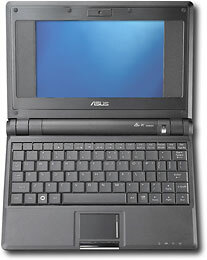 My search recently ended with the discovery of the Asus eee PC. The eee stands for Easy to Learn, Work, and Play, Excellent Internet Experience, and Excellent On-the-Go. This little marvel weighs in at 2 lbs; it's about the size of a medium sized paperback novel, has flash memory for disk storage (my model has 4 gigabytes), WIFI built in as well as Ethernet, sound and video connectors, and a slot for an SD memory card. There's also three USB 2.0 ports for hooking up your favorite accessories. What's more, there is a little surprise with the operating system: it's LINUX. I've used Windows for years and have hankered to experiment with Linux. So I ordered a black 4G SURF (it's the model without the camera). Bigger than a Laptop � but not as useful. 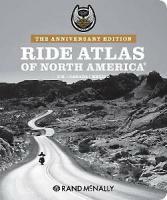 There's always some kind of licensing going on with the H-D label and the latest is a new North American atlas Milwaukee has stamped their name on from Rand McNally. Its 284 pages are chock full of state routes and interstates. Inside you'll find all the usual markings of an atlas, but the motor company has slipped in 39 suggested rides in the US including two for Washington (Grand Coulee and Olympic National Park), none for Oregon and none for Idaho. You also get a wall map that provides numerous alternative ways to go home from the 105 th anniversary celebration in Milwaukee this summer. For those of you living in upper Idaho or Washington your suggested route is I-94 to I-90. For those of you living in lower Idaho or Oregon your suggested route is lots of I-90 and I-84. How's that for creative?! The maps inside feature an added bonus of marking all the dealer locations along the way with a red bar and shield logo. This same information is available for ALL dealers (not just H-D) in Mapsources City Navigator software. To put it bluntly Tim's ASUS eee laptop (reviewed here) loaded with some basic mapping software will prove to be a far more practical use of a less amount of space. Our take: Skip this atlas and pack the laptop. As shipped, this is a full computer! It boots in less than a minute and it has a full suite of Open Office 2.0 software (word processing, spreadsheet, and presentation manager) along with Adobe Acrobat 7.0, a notepad, dictionary, Thunderbird email client, Firefox internet browser, Skype internet telephone software, video manager, photo manager, media player, sound recorder, several games, a personal information manager, screen capture program, and calculator. All of these programs are contained within a very nice graphical user interface (GUI) that will look very familiar to the MAC or Windows user. The keyboard is a QWERTY version with a touchpad, albeit a bit on the small side, but it is quite satisfactory for my size hands. The screen, while also small, is quite viewable. There's also a video output port so one could plug in a monitor and using a USB port for a keyboard which results in a pretty fair desktop unit. But that's not my intended use. As a test, I began using the unit without reading the small user manual. It was all very intuitive. The wireless and Ethernet have worked well for me. A friend brought over his portable hard drive filled with pictures which he created in a Windows environment and we plugged it into a USB port. It ran flawlessly to show his slide shows and pictures. The battery life is around 2.5 hours and the charger is about the size of cell phone charger and charges at 9.5 volts which means that I can easily charge it off of my motorcycle using a 12 volt to 9.5 volt charger which I found online. I tested my wireless mouse and it plugged in and functioned perfectly from first connection without adding any new drivers. The Open Office software saves in formats that are compatible with my desktop Microsoft Office suite and I've opened and saved files that I've created previously in Windows without a problem. Recently I was doing a presentation at a rider education event and I forgot my power cord for my big laptop. Fortunately I had saved my presentations on a thumb drive. So I plugged in the eee PC, hooked up the PowerPoint slide control device to a USB port, and the projector to the video out port. It worked like a charm. It really saved the day. I'm still experimenting with downloading tracks from my GARMIN and will report on that later. I've found several LINUX GPS programs and they definitely show promise for capturing tracks from my GARMIN 2610. I need to learn a bit more about LINUX. How much was all of this computing power? As purchased online from http://www.newegg.com it was $350. It was similarly priced at www.amazon.com and www.costco.com . It gets stares and questions everywhere I use it. It's a very good bargain and it's no wonder that Asus has sold 350,000 in the first quarter of sales. Recently Asus announced that there's a new model coming out that will have XP as an option for a nominal upcharge. For those not willing to use LINUX, this presents an attractive option. In my opinion, they've really hit the mark with this little gem. It hit the mark so well that my wife desired one for her travels. So we now have His and Hers eee PCs! She recently spent a week in New York and loved having the small size and and the WIFI connectivity to check email and surf the net. It traveled with her along with a number of other items in a small backpack during the day.